The American Express Hospitality Monitor 2007 was conducted by Loudhouse Research, an independent market research company based in the UK. Fieldwork was carried out during summer 2007. A total of 300 detailed quantitative telephone interviews were conducted with senior level operations contacts across European hotels and restaurants (France, Germany, Italy, Spain and the UK). These five markets are in the world’s top ten tourism destinations by arrivals (European Travel Commission 2007). Hotels and restaurants had to reach a threshold turnover level in order to qualify for the survey. The annual turnover threshold for hotels was set at €1 million while restaurants had to turn over a minimum of €200,000 per year as well as have a typical spend per head of at least €15. Key differences between hotels and restaurants, and by country are highlighted within the report. Hotels and restaurants are further classified into three groups to reflect their ownership status – independent, single site businesses, independent multiple site businesses and businesses that are part of a corporate group. Restaurants are classified into three groups based on spend - €15 to €35 (labelled “family casual”), €35 to €65 (labelled “mid market”) and €65+ (labelled “fine dining”). The American Express Hospitality Monitor 2007 provides operations management with a snapshot of the business outlook of other mid- to high-end European hospitality businesses and a meaningful insight into how hotels and restaurants are responding to the myriad pressures they face today. Three-quarters of Europe’s hotels and restaurants are as confident or more confident in the overall economic prospects facing their business compared to 12 months ago. More than a third (38%) are more confident than last year, while only 25% are less confident. 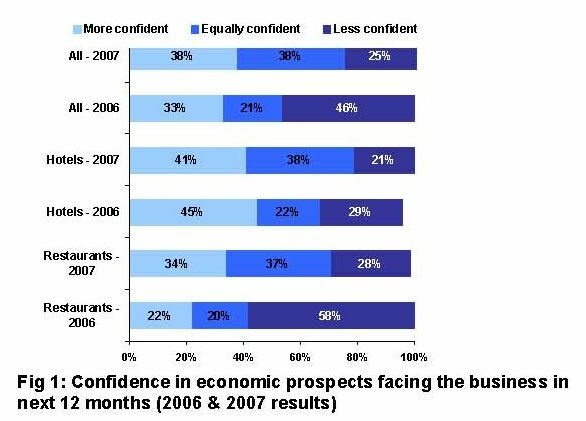 As in 2006, confidence is slightly higher amongst hotels (41%) than the more vulnerable restaurant sector (34%), although restaurant confidence has increased from 22% in 2006 while hotel confidence has dipped slightly to 41%. Market saturation, consumer choice, levels of disposable income and leisure time as well as legislative and regulatory forces are just some of the factors that impact businesses in the hospitality sector. Different markets vary in their levels of economic optimism, with businesses based in Spain and Germany the most likely to forecast a better year and those in Italy and France the least optimistic. Interestingly, 90% of German restaurants and 83% of German hotels reported increased revenues following their success as the World Cup host nation in 2006. London’s successful 2012 Olympic bid offers UK hospitality businesses a reason to be optimistic in the long term and developing and driving the UK forward as a tourist destination in the lead up, during and following the event. A Government-commissioned report has already predicted that the UK will benefit from more than £500m of added tourism revenue as a result of London 2012. In addition, the 2007 Catey Special Award which went to Lord Sebastian Coe and was sponsored by American Express, highlights how important London 2012 is viewed by the UK hospitality industry. Overall, half (49%) of Europe’s hotels and restaurants have raised their prices over the last year. 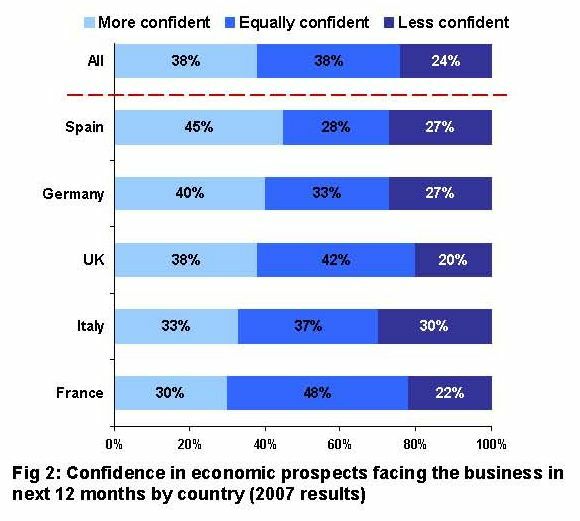 This was most prevalent amongst businesses with a positive outlook on economic prospects (74%) and least likely amongst those less confident about their economic prospects (30%). Clearly, a number of forces also have an impact on prices – for example, 22% of German businesses have adjusted prices in line with the VAT increase in January 2007 and 55% claim to have adjusted their prices slightly in response. This is set against a backdrop of general concern across Europe regarding inflationary pressures. Overall, the survey found that across all the business surveyed actual prices were typically either static over the last 12 months (33%) or increased by 1%-5% (33%). The American Express survey found that offering value for money is still of paramount importance to both hotels and restaurants. It is a reminder that while exceeding consumer expectations with all manner of new services to meet the ever-demanding needs of customers, organisations also must remain focused on ensuring healthy margins. Given the positive outlook many hotels and restaurants currently have, it is not surprising that the overall health of the economy registers relatively low on the list of significant business challenges facing Europe’s hotels and restaurants today. It shows that, as in 2006, direct competition is still the main issue keeping hotel and restaurant managers awake at night; indeed competitive pressures appear to be more keenly felt than 12 months ago. It is interesting that hotels consider direct competition to be more of a challenge (53%) than restaurants (41%) and this perhaps explains the recent ‘amenities arms races’ in which hotels are vying for custom by offering the latest and greatest in gadgetry and pampering. The highly competitive hospitality sector presents hotels and restaurants with a number of key challenges, including the need for clear differentiation in crowded marketplaces and the need to respond quickly and flexibly in line with changing competitive pressures. 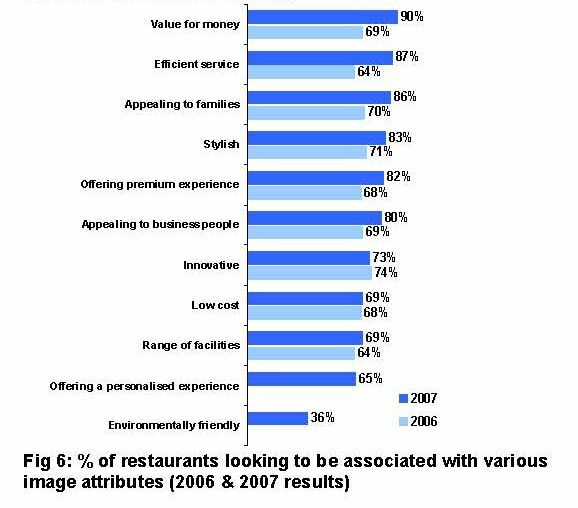 As in 2006, the pressures associated with keeping ahead of changing customer preferences is still keenly felt – again more notably by restaurants (15%), who are subject more to “food fashions”, fad diets and consumer desire for customisation and menu transparency than hotels (8%). 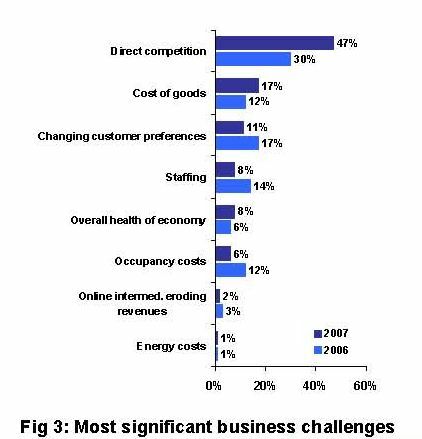 Reducing the cost of goods and services is a key business objective for 69% of hotels and 54% of restaurants. Margin is clearly critical in businesses, where capacity (whether rooms or covers) is fixed from a service perspective and keeping cost of goods down, where possible, is vital in maximising margin. Hospitality businesses are slightly more focused on growing their customer base (70%) than on achieving more spend from existing customers (60%). This is perhaps a symptom of a more energised marketplace and the fact that a number of businesses are in growth mode and keenly competing for new customers. Another interesting trend to note is the focus on partnership development and improved integration with suppliers. Partnership is much more likely to be a business objective in hotels today (45%) than in 2006 (27%). 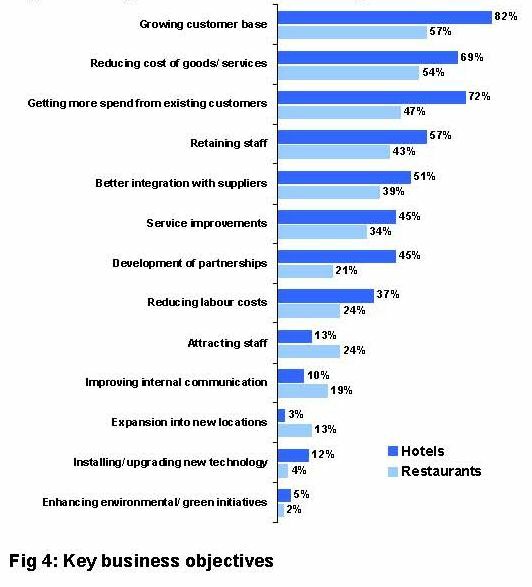 Similarly, integration with suppliers has become a more important objective amongst hotels (51% compared to 29% in 2006) and is twice as likely to be an objective for restaurants in 2007 (39%) than in 2006 (20%). These trends point towards a more connected supply chain and a focus on creative ways to attract new customers, through strategies such as affiliate marketing and loyalty network schemes which are discussed in more detail later in the report. As competitive forces intensify in the hospitality sector, the image that hotels and restaurants are looking to convey to customers becomes increasingly important. How a business is perceived by its audience, and the speed with which word of mouth, and web-based feedback spreads, can make or break a hotel or restaurant. So in 2007, what image are the hotels and restaurants of Europe trying to project and how does this compare to last year? 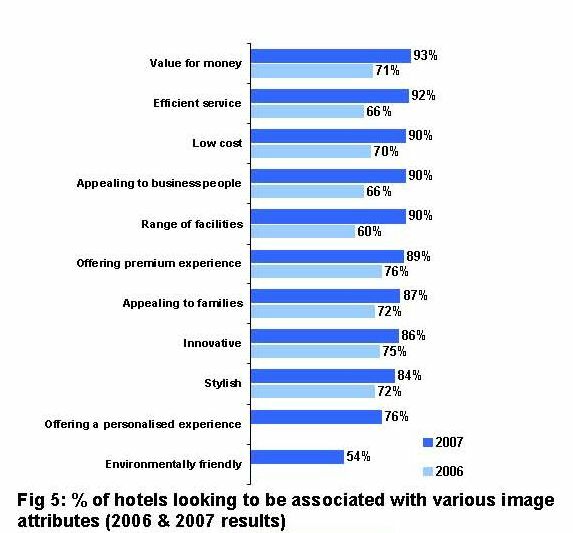 The American Express Hospitality Monitor 2007 shows that value for money and efficiency are coming to fore this year while innovation and style topped the list of attributes with which hospitality businesses wanted to be associated in 2006. This is not to undermine the importance of innovation and style, as these are actually growing in significance in percentage terms, but to highlight the relative importance of these other issues. Figures 5 and 6 show that value for money and efficiency top the list of desired attributes for about nine out of ten hotels and restaurants in Europe. This appears to highlight something of a back-to-basics mentality, with hospitality businesses recognising that at the end of the day customers should be getting what they want, when they want it at a price that is reasonable for the service provided, not necessarily the cheapest. The increasing significance being placed by hoteliers and restaurateurs on providing value for money reflects a trend amongst luxury consumers identified in a separate report from American Express entitled 21st Centurion Living. This study, which examined the changing needs of affluent consumers, found that the wealthy are increasingly looking for value. This is not to say that the wealthy are becoming avid bargain hunters. Instead, it’s all about the link between expectations and value being the critical equation in the luxury segment. Hoteliers and restaurateurs operating in the luxury space who place increasing focus on this brand attribute appear to be well positioned to deliver a product and experience that meets the needs of these “value luxury” consumers. With six in ten hospitality businesses agreeing that customer expectations for new services have increased over the last two years, hotels across the globe are indulging in something of an ‘amenities race’, vying to offer the ultimate in luxury whether that be customised bedding, multifunction entertainment, romance concierges or technology butlers. 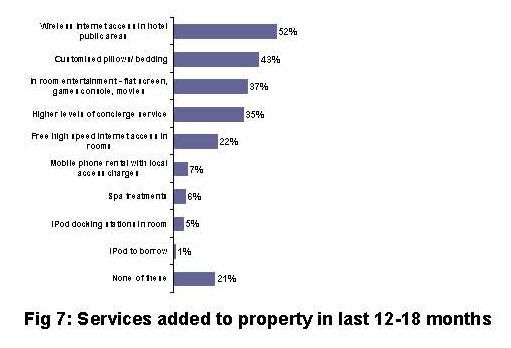 It shows the services that hotels reported adding to their properties in the last 12 to 18 months to meet the increasing expectations of customers. The main areas that have seen investment during this timeframe are offering public wireless Internet access (52%) and customised bedding (43%). Given that change is a constant when it comes to hospitality customers, the American Express Hospitality Monitor also sought to establish how businesses believe customers’ expectations around the concept of “good service” will evolve. 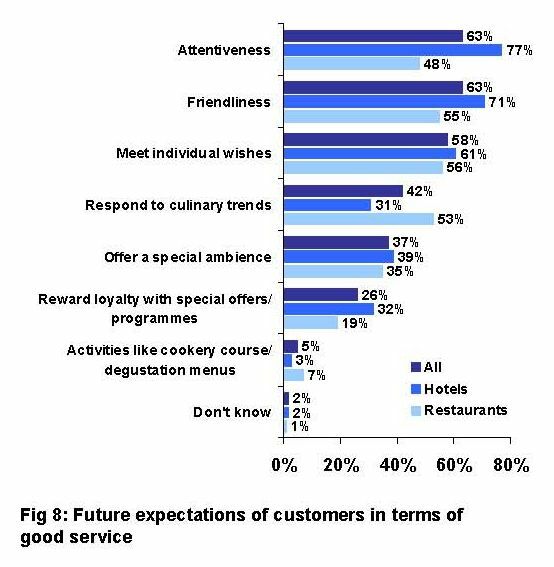 Figure 8 shows that while attentiveness (63%) and friendliness (63%) top the list and are particularly evident amongst hoteliers, the need to meet individual wishes (58%) is also expected to be a key trend. Central to satisfying increasingly demanding customers and achieving differentiation in increasingly crowded marketplaces is the need to understand and pre-empt customer desires. With only 42% of hospitality businesses collecting information on their customers in any kind of formalised or structured way and only 33% segmenting their customer bases on attitudinal factors as well as spend and demographics, there appears to be an opportunity for hospitality businesses to launch even more impactful personalised services.